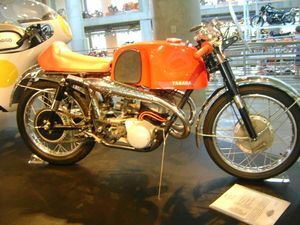 The Yamaha YDS-1 was a 250cc, 2-stroke, twin cylinder, twin carb, streetbike produced by Yamaha starting in 1959 that had a reputation for blowing away 650cc vertical twins during this time. 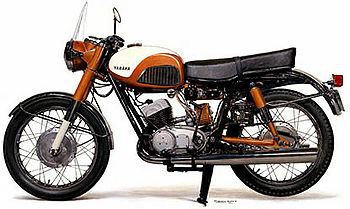 The YDS1-R was a race kitted version of Yamaha's new for 1959 street bike. These machines were Yamaha's first effort at building a European style road racer, their previous models were more dirt oriented to suit the Japanese racing scene. These machines were the forerunners of the very successful TD/TZ250 parallel twin racing machines that dominated that 250cc racing class for a number of years. This page was last edited on 21 January 2011, at 19:06.